Shirley Clarke – Is this reality? I would have liked to know her. Shirley Clarke has been making videowork in the 70ties and 80ties, that you might think I am building upon, if you didn’t know I only became aware of her work a few days ago. 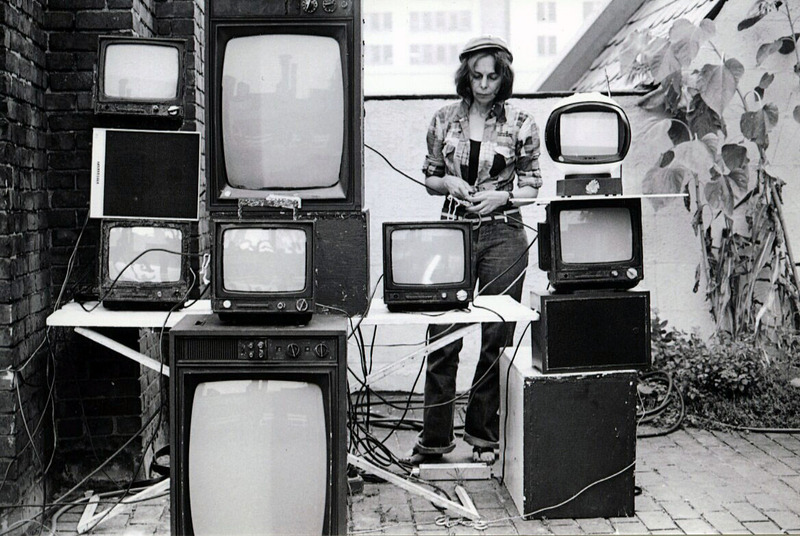 I was looking for information on a photo where she was kissing with Nam June Paik in a splitscreen installation by David Cort. For this I contacted Deedee Halleck who said I should look into Shirley’s work. She was right. I was especially smitten by what I learned of her participative and open video practice*. It’s somehow very close to how I treat webcam performance. This is a photo by Peter Simon from a blogpost written by Deedee Halleck. Her post also contains more images and some anecdotes on the inspiring TeePee workshops. I found Beth Capper‘s interesting article Building The Pleasure Palace Theater of the Future: Archiving Shirley Clarke’s Early Video Work, but unfortunately the archival website she planned to make doesn’t seem to exist anymore. And there is Andrew Gurian‘s who describes a night long workshop : Thoughts on Shirley Clarke and The TP Videospace Troupe, that contains also this citation from an interview with her published in Radical Software (New York: Gordon and Breach, Science Publishers, Inc.; Vol. II, No. 4, 1973) p. 27. Complete 53 min on vimeo. Beth Capper (2013) Ultimate Participation Video: Shirley Clarke’s Tee Pee Video Space Troupe, Art Journal, 72:1, 46-63.